Fortune Magazine has called out U.S. President Donald Trump for having “the stock market on a string, but investors are less sure of the game he’s playing.” Bloomberg is parroting the same, and the LA Times has been talking about the U.S./China trade policy driving stock prices too. But ordinary citizens do not buy stock. The world’s “average” people live and die underneath the mighty, with only presidents and elected officials to protect them. Here’s a opinion on why Donald Trump is not serving the best interested of the people of the United States of America. It is important to note here that a similar buy spike occurred in trading of General Dynamics stock on the day before an American president would “advertise” for the notorious F-35, made by GD. If you read the president’s speech, he actually lauded Lockheed and “the fantastic new F-35 jet fighter. The five dollar per share buy ended in a 5 dollar per share sell the next day according to my research at Yahoo Finance historical data. In that case, the “method” seemed identical if there is a method to Trump’s policies. And remember, America just elected a wheeler and a dealer of a business tycoon. 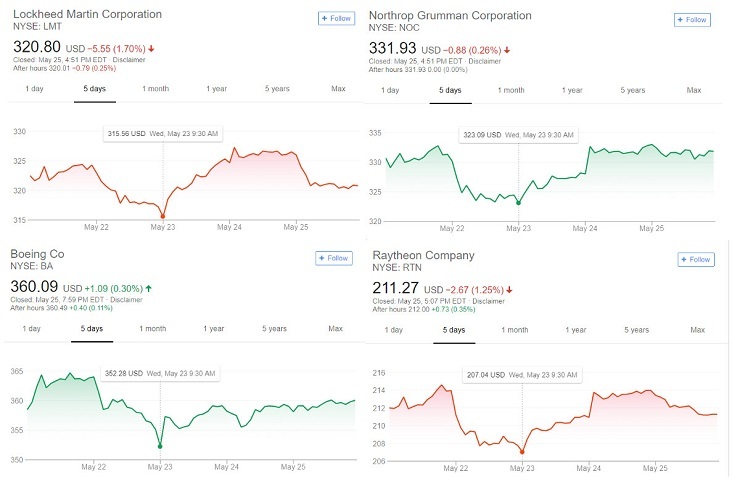 General Dynamics stock also registered the same “buy” marker on May 23rd, as did Huntington Ingalls Industries, which is building Trump’s new 350 ship navy. Fifty-seven years ago former Five-Star General and President Dwight Eisenhower gave a memorable farewell address to the nation framed around the dangers of our military industrial complex. Eisenhower’s successor, John F. Kennedy mirrored these sentiments, which some experts say is what got him killed. This “influence” has run American policy since World War II ended, and now Donald Trump becomes the latest lackey in a long line, taking food from the mouths of the hungry and destitute. For those who would argue against my theories, I assure you they are not mine alone. During Eisenhower’s time, a famous sociologist named C. Wright Mills wrote the book The Power Elite, which claimed, among other things, that a class of military, business, and political leaders, driven by mutual interests, were the real leaders of the state, and that they were effectively beyond democratic control. And there are scores more scholarly moderators who’ve tried (mostly in vain) to inform the public of the skullduggery of these power brokers. However, all anyone really has to research are the names of defense corporations feeding vast sums of money to Washington think tanks and special interest lobbyists, politicians, institutions, Congress and the Executive Branch. Nowhere in this constitution does the document stipulate that America’s chief executive is authorized or allowed to manipulate news, markets, and the truth in order to benefit one segment of society over another. 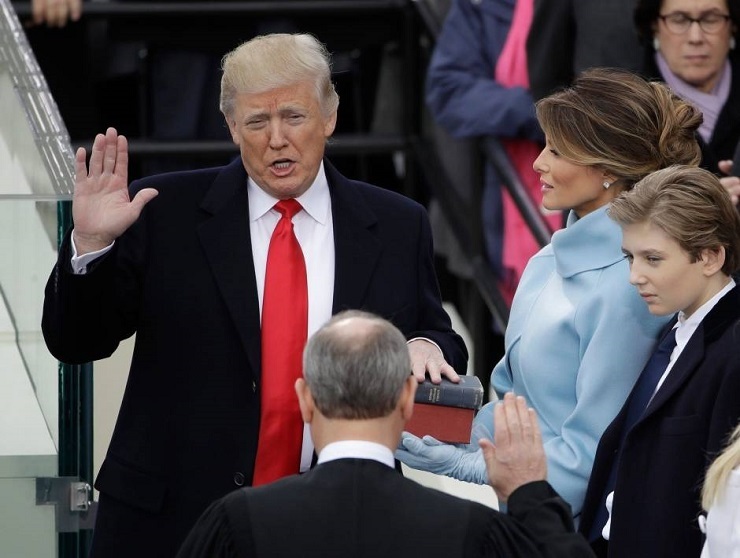 Donald Trump swore to the American people he would drain the swamp that Washington politics has become. But so far no slimy swamp critters have been seen leaving. Donald Trump swore he would put an end to useless and excessive spending to support unwinnable wars, but instead he seems to be leveraging the rumors of such wars. I believe this is the reason Donald Trump appears so unpredictable. I believe he is a wind-up toy for the aforemented power elite.